Using a nanoscale drum, scientists have built a laser that uses sound waves instead of light like a conventional laser. Because laser is an acronym for “light amplification by stimulated emission of radiation,” these new contraptions – which exploit particles of sound called phonons – should properly be called phasers. Such devices could one day be used in ultrasound medical imaging, computer parts, high-precision measurements, and many other places. A laser is created when a bunch of light particles, known as photons, are emitted at a specific and very narrow wavelength. The photons all travel in the same direction at the same time, allowing them to efficiently carry energy from one place to another. Since their invention more than 50 years ago, almost all lasers have used light waves. Early on, scientists speculated that sound waves be used instead, but this has proved tricky to actually achieve. It wasn’t until 2010 that researchers built the very first sound lasers, coaxing a collection of phonons to travel together. But those first devices were hybrid models that used the light from a traditional laser to create a coherent sound emission. In traditional lasers, a bunch of electrons in a gas or crystal are excited all at the same time. When they relax back to their lower energy state, they release a specific wavelength of light, which is then directed with mirrors to produce a beam. Sound lasers work on a similar principle. For Mahboob and his team’s phaser, a mechanical oscillator jiggles and excites a bunch of phonons, which relax and release their energy back into the device. The confined energy causes the phaser to vibrate at its fundamental frequency but with at a very narrow wavelength. The sound laser produces phonons at 170 kilohertz, far above human hearing range, which peters out around 20 kilohertz. 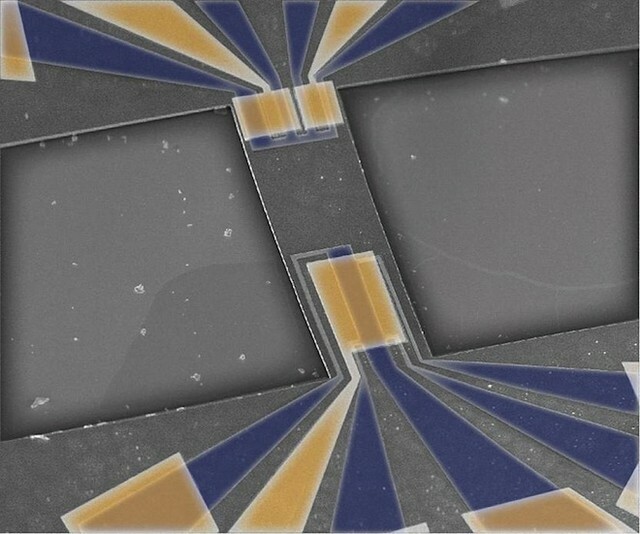 The entire device is etched onto an integrated circuit that’s about 1 cm by 0.5 cm. Don’t expect to set your phasers to stun just yet. Light has the advantage of being able to travel through a vacuum, so a laser beam can easily go from its origin point anywhere else, even through space. Phonons require a medium to travel through, which means the phaser waves are confined to their device for the time being. “We would lose the lasing if we get it out,” said Mahboob. “So we will need to figure out how to build structures onto the resonator that would allow us to transmit the vibrations out as energy.” Currently, he doesn’t have a good idea of how to do that, though other researchers will likely expand on the work and offer suggestions. While this means you can’t make the cat chase after a tiny dot of sound, there are still a lot of potential uses for these phasers. A tiny part of the device translates the mechanical vibration into an oscillating electrical signal, which could serve as a tiny clock. Most modern day electronics use a quartz crystal to keep time but these crystals tend to be relatively bulky objects that consume a lot of energy. A miniscule sound laser could provide the same effect and replace quartz crystals, said Mahboob. Other potential applications, once the technology matures further, would be to use the ultrasound frequencies to scan objects or people for safety or medical purposes. Alternatively, the extremely narrow sound wavelengths could be used for high-precision measurement, suggested electrical engineer Jacob Khurgin of Johns Hopkins University in Baltimore, Maryland. Khurgin praised the research. “It’s still in its infancy, but they showed it can be done, and more people will get involved,” he said. Optical lasers have found hundreds of uses in modern life, in computer electronics, science, medicine, and the military. But their power wasn’t immediately apparent when they appeared a half-century ago. The first paper on a laser using visible wavelengths was rejected from a journal whose editors thought it a waste of time.